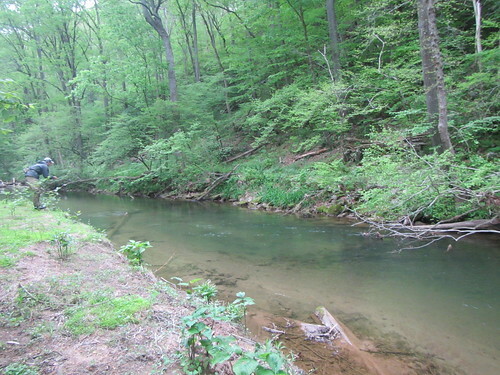 The Gunpowder River is flowing at a nice, stable 72 CFs and is 48 to 56 F throughout the catch and release section. The above picture is of Josh Reider-he’ll be in the shop tomorrow and knows the Gunpowder. The water is clear and the fish are taking Sulphurs sized #16 and Caddis in the #18 range with abandon. Snowshoe Rabbit Phunny Emergers and Unusuals will work fine in the riffles. Comparaduns and Bachkosky’s Para-Spinners are better choices in the flats. Last week MDDNR fisheries stocked the section above Falls Rd with 5, 000 fingerling rainbows. There is really no compelling reason to fish very early as the water temps are quite cool at the start of each day. 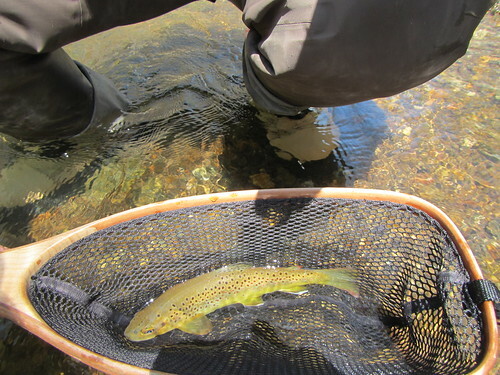 Plan to fish streamers in the boulder pools as the Browns have been hammering the little stocked fish! Bright days have been a little tougher-find some shade and you’ll catch some fish. Quick note to let you know I fished the upper section yesterday 5/26, and the dry Sulphurs were happening. There was plenty of emerger action as well but I decided to put on a dry, around a #16, despite noticing only a few Sulphurs returning to the water. It was like ringing the dinner bell as I was getting a strike approximately every 5-7th cast. Notice I didn’t say I was catching a fish every 5-7th cast but I was getting some spectacular strikes with fish clearing the water the entire length of their body, some going head over tail a.k.a Great White style….really cool. Great day on the river yesterday. Like you said surface action heated up up around 4pm. They were coming up for a size 14 sulfur pattern. Caught 4 about this size, all 8” or so, all browns, all within about 100 yards of the bunker hill parking lot. Thanks again advice and see you soon. This entry was posted in fishing report on May 31, 2013 by Theaux Le Gardeur. The Gunpowder is flowing at 89 CFs and 63F and is gin clear. Sulphurs sized #14-16 and Caddis in the #16-18 range have been part of the mix this week as spillover from Prettyboy dam has created warmer than average temperatures throughout the catch and release section. A little further downstream, streamers and nymphs have been the ticket. We have Mike Bachkosky’s Sulphur Unusual and Phunny Emerger patterns in the shop and a host of CDC/Elk wing caddis. Traditional streamers like grey ghosts have also arrived. Bring a jacket and get out there and fish some dries this weekend! This entry was posted in news on May 17, 2013 by Theaux Le Gardeur. The Gunpowder River is clear, flowing at 89 CFs and is 52 F. Caddis have been coming off this week in the #14-16 range. Hendricksons have been starting closer to 2:00 PM. High winds in the afternoon and the cooler temperatures that follow have delayed any concentrated spinner falls. You’ll find plenty of mayfly nymphs on the beaver chews upstream of Falls Rd. Bwo’s and grey midges are present but the didymo above Falls Rd had made the nymph fishing challenging. We’ve had good reports from streamer fisherman throughout the catch and release section and down into the two fish a day stretch. 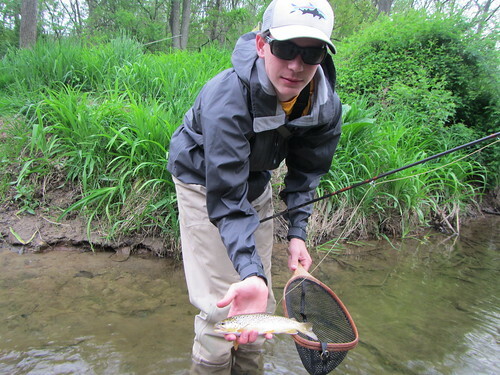 There are plenty of easy rainbows left from the second stocking at Glencoe and Sparks in the five fish a day section. Keep in mind that the stocked fish will eat and indicator quicker than the fly under it. I fished the Gunpowder today at the Massamore Road section. I was about 100 yards downstream from the parking area. I only fished for about an hour, but caught three browns.One was about six inches and the other two were about 10 to 12 inch range. I fished a size 16 red quill Gordon dry. The little one I caught stripping the fly back to me and the other two were caught on top. The fish are indeed looking up. I also made a couple casts in the pool at the parking lot and had a nice fish hit the fly as I was retrieving it. The red quill was the ticket. 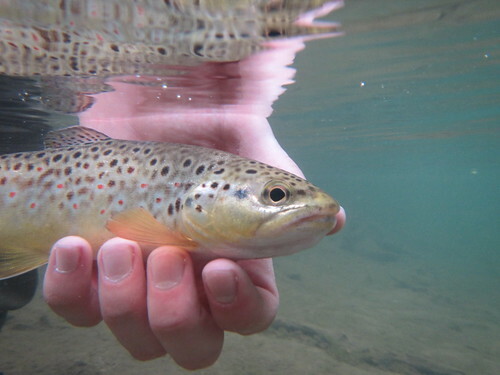 This entry was posted in fishing report on May 2, 2013 by Theaux Le Gardeur.